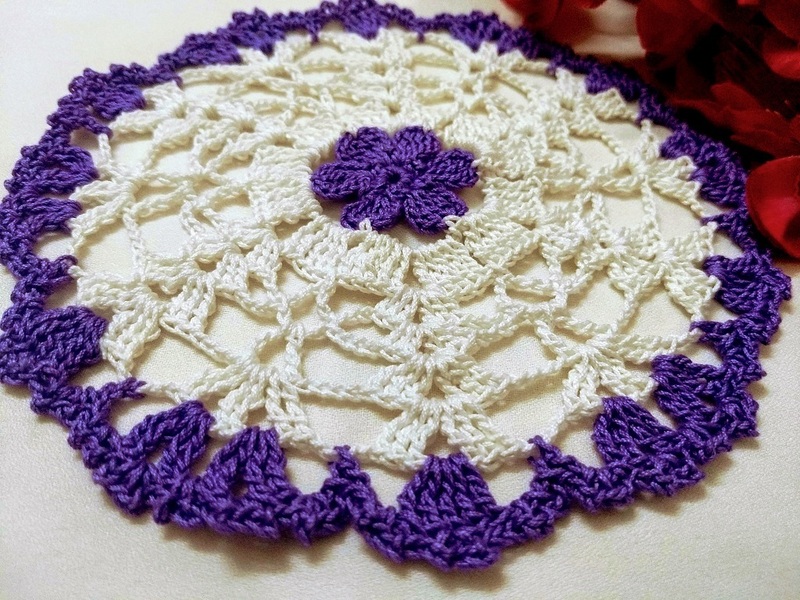 Dainty Doily made on customized order, Love the delicate border of this doily. Six petal flower in the center moving outward and ending with a simple, delicate lace. This is a beginner’s project with simple instruction. This is a free pattern, use yarn of your choice. 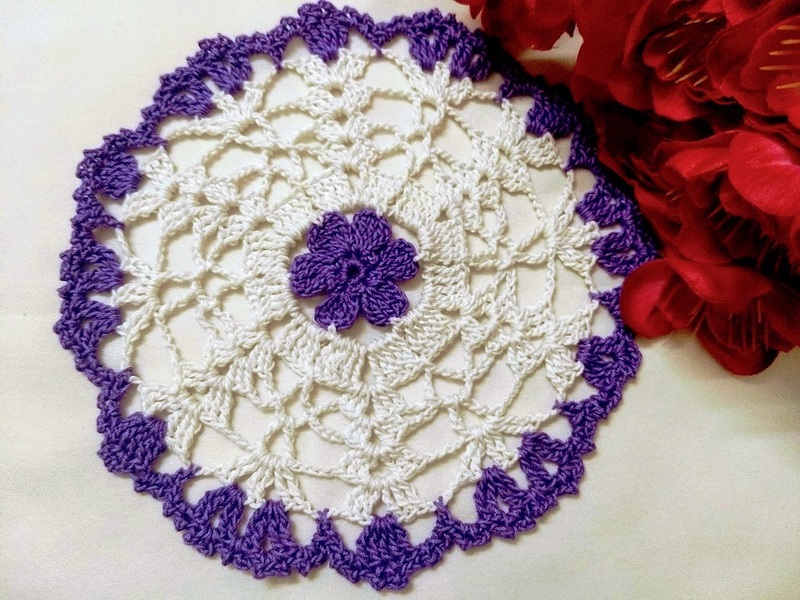 This pretty doily is worked in two colors. 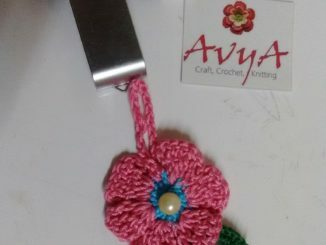 It is crocheted in the round starting in the center with the flower and working outward from there. 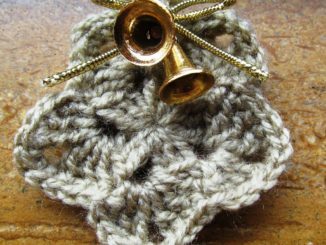 This is an easy crochet project that works up quickly. The motif measures about 15 inches in size. The sizes will vary based on supplies used and other factors. Ch 1, sc in same st as joining, *[sl st, ch 4, 3tr], ch 4, sl st in next st, ** sc in next st, rep from * around, ending lat rep at**, join in beg sc, fasten off. With color B attached, sl st in top of any 3-tr, ch1, sc in same st, ch 8 (sc in top of next 3 tr, ch 8) rep around, join in beg sc. Sl st in next sp, ch 4 (count as first tr throughout), (4 tr, ch 2, 5tr) in some, sp (5 tr. Ch 2. 5 tr) in each remaining sp around, join in 4th ch of beg ch-4. Sl st in each of next 4 tr and in ch-2 sp, (beg, 3-dc, ch 2, 3-dc) I n same sp, *ch 6, sk next 4 tr, sc between next 2 tr, ch 6**. [3dc, ch 2, 3 dc] in next ch-2 sp rep from * around ending last rep at **, join in top of beg 3 dc. Sl st in ch-2 sp, [beg 3dc, (ch 2, 3dc, twice)] in same sp * (ch 4, sc in next ch-6 sp) twice, ch 4** [(3dc, ch 2) twice, 3 dc] in next ch-2 sp rep from * around ending last rep at**, join in top of beg 3dc. Sl st in first ch-2 sp, ch 4, 2 tr in same sp, * ch 2. 3tr in next ch-2, tr) in next ch-4 sp, ch 3 **, 3 tr in next ch-2 sp, rep from * around, ending last rep at **, join in 4th ch of beg ch-4. Sl st in each of next 2 tr and in ch-2 sp, ch 4 (2 tr, ch 2, 3 tr) in same sp, *ch4, (2 tr, ch 2) twice in next ch-2 sp, 2 tr in same sp, ch 4**. (3 tr, ch 2. 3 tr) in next ch-2 sp, rep from * around, ending last rep at **, join in 4th of beg ch-4 fasten off. Attached Color A with a sl st in first ch-2 sp of Rnd 8, ch 4, 5 tr in same sp, *ch 4, sc in next ch-4 sp, ch 4, [(2 tr, ch 2, 2 tr) in next ch-2 sp] twice, ch 4, sc in next ch-4 sp, ch 4**, 6 tr in next ch-2 sp, rep from * around, ending last rep at **, join in 4th ch of beg ch-4. Sl st in each of next 2 tr, sl st between same tr and next tr, ch 1, (sc, ch 2) twice in same st, *[(sc, ch 2) twice in next ch-4 sp) twice, (sc, ch 2] twice in next ch-2 sp, sk next tr, (sc, ch2) twice in next ch-2 sp, [(sc, ch 2) twice in next ch-2 sp)] twice ** sk next 2 tr, (sc, ch 2) twice between next 2 tr, rep from * around, ending last rep at **, join in beg sc. 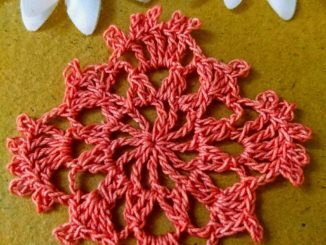 What Can You Do With Dainty Doily? Use it as a center piece. Make 7 numbers of the motif and join to make a fancy market bag. Multiple motifs can be converted to table liner. Make use of thinner yarn and convert the pattern to make pretty establishment. For single size spread about 70 X 105 inches, make 292 motifs. For a double size spread about 88 X 105 inches, make 370 motifs. Use to decorate your pale cushion covers of pillow covers.